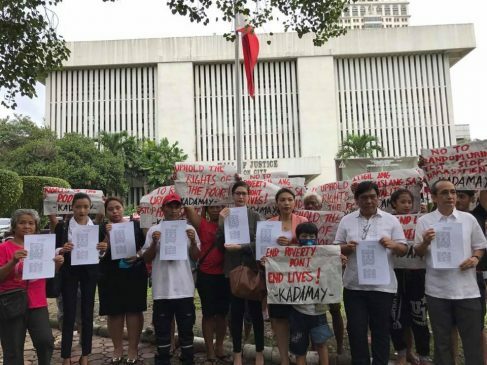 MANILA – Human rights lawyers and urban poor residents of Quezon City has asked the courts to order a halt to the so-called “voluntary” drug testing being conducted by the Philippine National Police in communities in the city. The National Union of People’s Lawyers (NUPL) led 30 Quezon city residents who filed a petition for temporary restraining order against the drug testing at the Quezon City Regional Trial Court on Wednesday, Aug. 30. The group said the house visits by police compelling urban poor residents to undergo on-the-spot drug testing violate their right to privacy and and presumption of innocence, and their right against self-incrimination. “The compulsory survey and essentially coercive drug testing operations do not even have a clear policy or plan on what to do with those correctly or incorrectly found to have traces of drugs through the crude and unreliable instant tests,” said Josalee Deinla, NUPL secretary general for legal services in a statement. The house-to-house operation was conducted by the police in Payatas village and South Triangle. The complainants narrated in the petition how they were pressed to submit to the police’s anti-drug operation. They said the police conducting the operation carried firearms, which intimidated residents who eventually followed their orders out of fear. The petition cited that the police intruded into the private spaces of the complainants, and brought a “coercive and harassing environment,” thus, forcing the residents to follow. “There is not only threat, harassment or intimidation, but pain of imminent punishment when the police conveyed that those absent, uncooperative, or unwilling shall be put on a list,” the petition read. The NUPL also said that the operation is persecutory. “It presumes that the poor are drug addicts or pushers that have no rights under the law and the Constitution,” Deinla said. She said this equates to the discrimination of the poor, which violates the spirit of equality of all under the law. While police sweep urban poor communities, they spare posh subdivisions and residences of the wealthy, she said. In a statement, Kalipunan ng Damayang Mahihirap (Kadamay) chairperson Gloria Arellano blasted the house-to-house drug testing by police, saying that those who would test positive for using illegal drugs would not be rehabilitated, but would be listed as targets. “What if the tests confirm a user, albeit a one-time user? Are there mechanisms to distinguish him from the others? These tests are not going to lead to rehabilitation services anyway; it is a tool for more violence in communities,” she said. There are varying numbers of those killed in the government’s War on Drugs, which continue to rise. Police put the toll of those killed in legitimate police operations at less than 4,000, while some human rights groups estimate the number at around 12,000, including those killed by vigilante attacks. Most of those killed in the crackdown came from urban poor communities. Arellano suspected that police officers get bonuses for their “achievement” in the government’s War on Drugs. “The results of the drug testing can be manipulated to show that those who are tested are drug users. The PNP is clearly benefiting from the bloated number of deaths. President Duterte has been rewarding his police for murdering Filipinos,” she said.